Enjoy this healthy baked chicken recipe. Takes about 30 minutes to make and is healthy and tasty for the whole family. Try it tonight! Using avocado oil spray lightly grease a 9×13 inch baking dish and preheat your oven to 350 degrees. 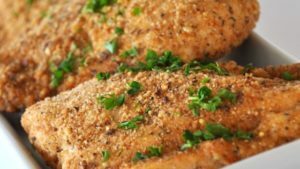 Bake for 25 -30 minutes in the preheated oven, or until chicken is no longer pink. Consider using cooking thermometer. It will not only keep you safe from harmful food bacteria but it also helps you to avoid overcooking the chicken, keeping it juicy and flavorful. Serve over steamed brown rice and/or steamed vegetables.